GIANT ICEBERG IS POISED TO BREAK OFF ANTARCTICA, SCIENTISTS SAY | "Global Possibilities"
An iceberg the size of Delaware is poised to break away from Antarctica, potentially triggering the collapse of the continent’s northern ice shelf, scientists announced Thursday. When it breaks off, or calves, the iceberg will be one of the ten largest ever recorded, BBC News reported. It encompasses an area of 1,900 square miles, and it is clinging to the ice shelf in question, Larsen C, by only 12 miles of ice. “If it doesn’t go in the next few months, I’ll be amazed,” said Adrian Luckman, a professor at Swansea University and a project leader on the team tracking the event, told BBC News. A rift separating the iceberg from Larsen C has been steadily developing for years, but increased suddenly by 11 miles within the latter half of December. Researchers said that “the calving event was ‘part of the natural evolution of the ice shelf,’ but added there could be a link to changing climate, though they had no direct evidence of it,” according to NBC News. 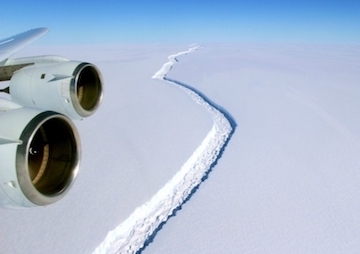 “When it calves, the Larsen C Ice Shelf will lose more than 10 percent of its area to leave the ice front at its most retreated position ever recorded; this event will fundamentally change the landscape of the Antarctic Peninsula,” the scientists wrote. Indeed, if the calving triggers the total break-up of Larsen C, it would be the third major Antarctic ice shelf to collapse since the mid-1990s. Larsen A and Larsen B collapsed in 1996 and 2002, respectively, after similarly massive icebergs broke off and triggered sudden large-scale break-ups. “We are convinced, although others are not, that the remaining ice shelf will be less stable than the present one,” Luckman commented to BBC News. Nika Knight is a staff writer for Common Dreams.